Ghada Samman - Who is Ghada Samman? 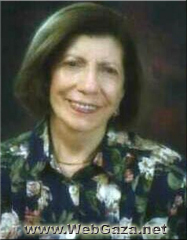 Writer and novelist Ghada Samman was born in al-Shamiya in Syria in 1942. Her primary schooling was at the French Lyceé in Damascus, and then she attended government school. She moved to Beirut in 1964 where she studied and graduated from the American University of Beirut. She attended the London University for a while, and received a Doctorate from Cairo University. Her first language was French, followed by Arabic and the learning of the Quran. Ghada Samman was a strong willed girl and to antagonize her father who insisted that she study science and become a doctor, she switched her focus after completing her baccalaureate in science, and studied English literature. Early on she learned to enjoy financial independence: she taught English at a secondary school in Damascus, found employment in the college library, and while at the AUB, she worked as a teacher at Charles Saad School in Choueifat, and then as a writer for the newsmagazine al-Usbu’ al-Arabi. She wrote for al-Usbu’ al Arabi, al-Hawadith, and other Arab newsmagazines. She spent a short time as a radio broadcaster in Kuwait, and founded her own publishing house, “Ghada Samman”. In 1966 she was sentenced to prison for three months for anti-authoritarian expression, and left Syria without the state’s permission. She spent many years as a single woman, living and working in various Arab and European countries. Finally she settled in Beirut, because Beirut represented for her an oasis of Arab freedom. Her first published story “Inspired by Mathematics”, and it appeared in “al-madrasa al-thanawiya”, a secondary school journal. - Novels: “Beirut 75”, “Beirut Nightmares”, “The Night of the First Billion”, “Exile Below Zero “. The first three are a trilogy based on the experience of the civil war in Lebanon, immigration, nationalism, and exile during the Israeli invasion 1982. - Essays and other writings: “Love”, “I Declare Love”, “Swimming in a Sea of Devils”, “The Tribe Interrogates the Victim”.. Her writing focused on issues concerning Arab women and Arab nationalism. Honest and outspoken in her opinions, she founded her own publishing company in order to continue to write her opinions uncensored. She has published collections of short stories, essays, poetry, and interviews as well as several novels.